Portland ‘Pataphysical Society is pleased to present Constellations, an exhibition featuring LA-based artist Christine Nguyen, curated by Grace Kook-Anderson. 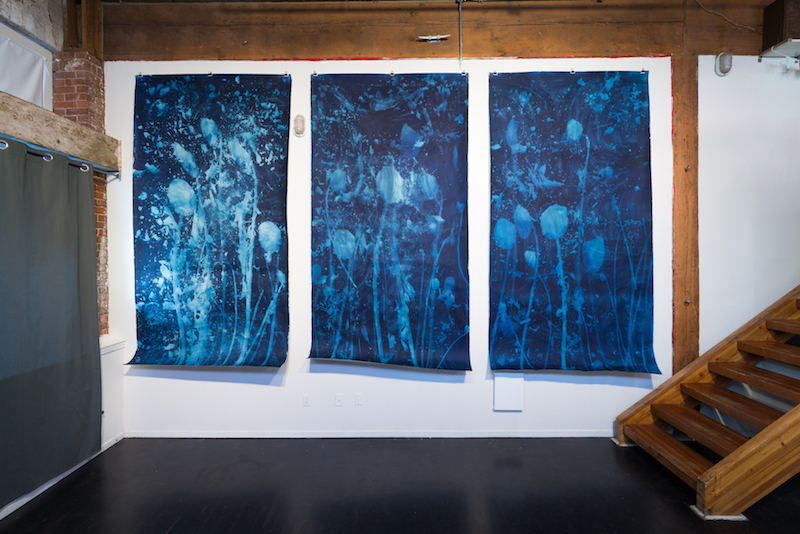 Large-scale cyanotypes of sunflowers will create an otherworldly atmosphere in the gallery space. The sunflower has long been a metaphoric image in art history, even most recently with Ai Wei Wei’s vast sunflower seed installation Kui Hua Zi (Sunflower Seeds), the attention is drawn to scale and our relationship to this plant. Perhaps the strongest connection with Nguyen is with Anselm Kiefer and the influential ideas of the English philosopher and Occultist, Robert Fludd (1574-1637). Fludd believed that every plant had a corresponding star in the cosmos, in which direct connections were made between the microcosmic earth and the macrocosmic celestial space. Ceramic salt crystalized sculptures will also be featured in the exhibition. Resembling fossils, the objects reference diatoms (marine and/or freshwater single-celled algae) while also pointing to connections to extraterrestrial remnants, at once familiar and alien. Similar to the sunflower cyanotypes, Nguyen draws our attention to the connection between the materiality of earthly objects to those same materials in the greater universe. Constellations is part of a yearlong series of guest curated exhibitions at Portland ‘Pataphysical Society. Christine Nguyen (b. 1977, Mountain View, California) lives and works in Long Beach, California. She received her BFA from California State University, Long Beach and MFA from the University of California, Irvine. Nguyen has exhibited nationally and internationally. Solo exhibitions of her work have been featured at the Hammer Museum, Michael Kohn Gallery, AndrewShire Gallery in Los Angeles; Crisp-Ellert Art Museum, St. Augustine, Florida; 10 Chancery Lane Gallery, Hong Kong; and Galerie Quynh in Ho Chi Minh City, Vietnam. Nguyen’s work has also been included in group exhibitions at the Kunsthalle zu Kiel, Kiel, Germany; Laguna Art Museum, Laguna Beach, California; Pasadena Museum of California Art, Pasadena; San Art, Ho Chi Minh City, Vietnam; Sprueth Magers Projekte, Munich, Germany; Dancing Elephants Project, Bogota, Columbia; and Churner and Churner in New York. Nguyen has been commissioned numerous public works including the UCLA Medical Center in Sylmar, California by the Los Angeles Arts Commission; two projects by the Los Angeles County Metropolitan Transportation; Malibu Library; Fire Station 132 in Santa Clarita, California; Ontario Airport, and L’hotel elan in Hong Kong. She was recently a recipient of the COLA (City of Los Angeles) 2016 Individual Artist Fellowship. Nguyen was also the recipient for the 2015-2016 Arts Council for Long Beach Professional Artist Fellowship. Grace Kook-Anderson has recently been appointed the Arlene & Harold Schnitzer Curator of Northwest Art at the Portland Art Museum. She is also an Adjunct Assistant Professor of Art in the school of Art + Design at Portland State University. Her most recent curatorial projects have included The Land Mark Show at the Center for Contemporary Arts, Santa Fe, looking at ecological perspectives by artists located in the Western United States; and Yesterday’s Future at the Orange County Great Park Gallery, examining the City of Irvine’s idealized master plan of a university and city encapsulated in architect William Pereira’s design of UCI’s campus.